David Ortiz has enjoyed 11 successful seasons in Boston. The slugger hopes to remain with the Red Sox for several more, although he acknowledged Sunday that baseball is a business. “Hey, I would like to [retire with the Red Sox]. I’m having fun. 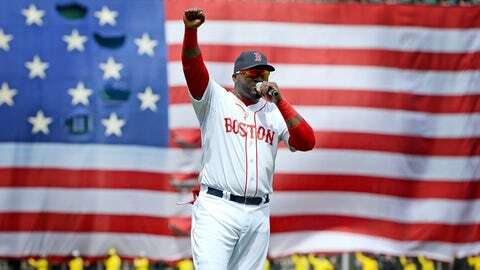 It’s been a hell of a ride as long as I’ve been here,” Ortiz said. “But as I always keep on telling people, this is a business. Sometimes you’ve got to do what’s best for you and your family. Ortiz, who signed with Boston prior to the 2003 season, has won three World Series titles with the Red Sox while cementing himself as one of the best big-game players in Major League Baseball history. The 38-year-old is coming off a strong 2013 campaign in which he batted .309 with 30 homers and 103 RBIs in 137 regular season games. “It can be two years, it can be three years, it can be 10 years. You never know,” Ortiz said Sunday when asked how much longer he expects to play. Ortiz signed a four-year, $52 million deal prior to the 2007 season. The Red Sox then picked up his $12.5 million option for the 2011 season and agreed to a one-year, $14.575 deal for the 2012 season. Ortiz currently is in the second year of a two-year contract he signed last offseason. Ortiz, who spent his first six years with the Minnesota Twins, is entering his 18th major league season. The nine-time All-Star plans to continue playing as long as possible, although he also seems to understand that his career likely is entering its final stages.